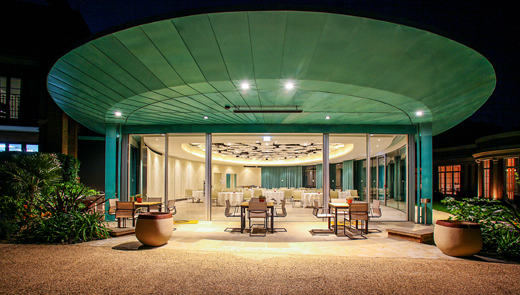 This is the elegant ellipsoidal pavilion of the new Cedar Suite at the 5 Star Grove Hotel at Chandlers Cross. It was designed by Purcell and Martin Hulbert Design with AECOM as Structural Engineers, Galliford Try as main contractor and their appointed metal roofing and cladding specialist contractor, CEL Group. 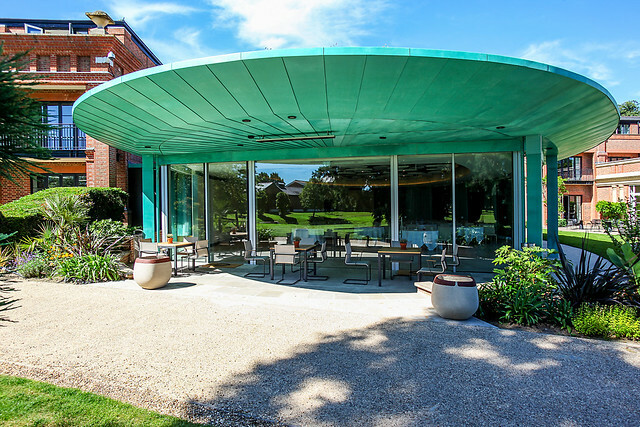 The Cedar Suite is a 150 cover conference and wedding facility, incorporating a 13x20m elliptical pavilion occupying a garden setting adjacent to the main buildings of The Grove. 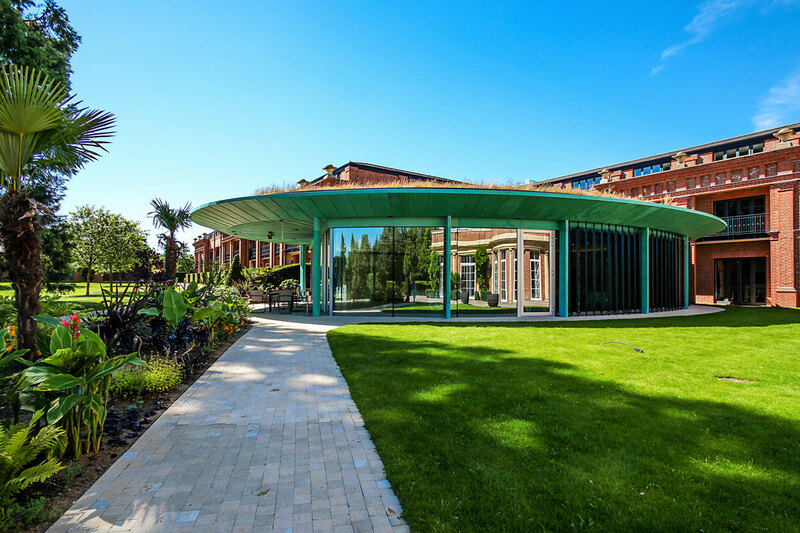 The unique form of the glass and copper ellipse was developed by the design team as a complete contrast to the existing architecture, following an inspirational set of design meetings. 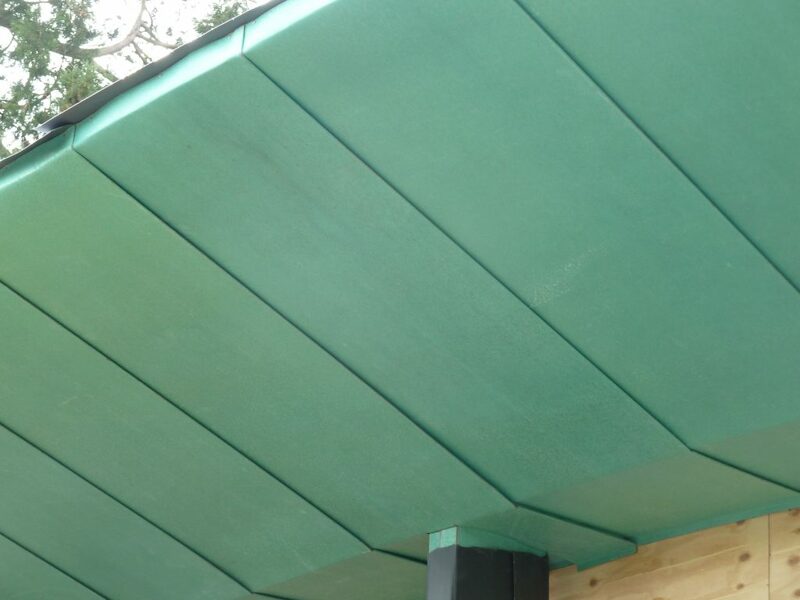 The project will feature in the October issue of the RIBA Journal and we thought we would take some space here on the SIG Zinc and Copper Blog to look in more detail at the structure and execution of the pavilion in conversation with Michael Wright, AECOM’s Structural Engineer for the project. “There are certain features of this building that have not been done before, and so we had to think about things from first principles,” explains Michael Wright. The first was how to form the structural form in an efficient way. To deal with this Jeremy Blake of Purcell, a former Rome Scholar, proposed using the Borromini Ellipse, such as that used in Borromini’s design for the church of San Carlo alle Quattro Fontane in Rome, to rationalise the geometry. This is an ellipse built from just two radius curves, a long radius on the sides and a shorter radius curve on the ends. 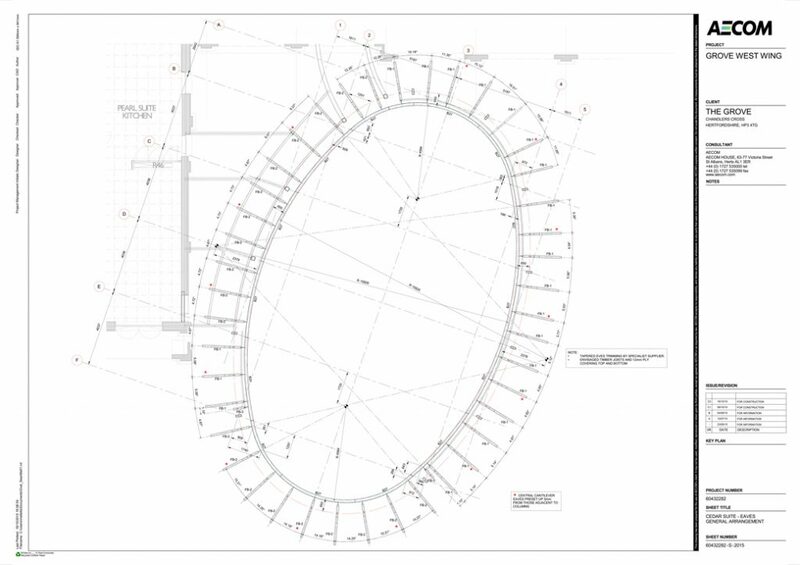 The decision to use the simpler form made all the construction decisions simpler by reducing all the curves to just two templates types, one for each radius, thus forming what could be a very complex shape in a very cost effective way. This decision affected every single trade thereafter, from the steelwork and glass shaping to the timber roof construction and cladding. The second decision was to create 2.5m tapered, cantilevered eaves around the pavilion, a significant structure made more significant as the cantilever is drawn into a virtual tip at the edge. Deflections in the structure could cause this fine edge to waver around the building, which would be very noticeable on the finished pavilion. Working with the architects and the metal subcontractors to discuss how the design could be executed in copper, the engineers developed a structural support system that was not only easy to build, but also would ensure that deflections were assessed and designed out. The structure was pre-cambered to varying amounts, so that once all the dead load was applied, the roof settled down so that the tip of the cantilever is at the same height all around the building. The cantilevers are formed by structural steel arms at every 1200mm, joined by curved timber purlins and timber rafters back to the primary steelwork. Thanks to the decision to use the Borromini Ellipse, only two sets of templates for the purlins and rafters were required. Another unique element of the building is the “Privacy Blades”. These floor-to-ceiling glass panels pivot to allow uninterrupted views of the garden, but rotate to screen off the 340-seater Amber Suite just 20m away should there be two functions happening at the same time. 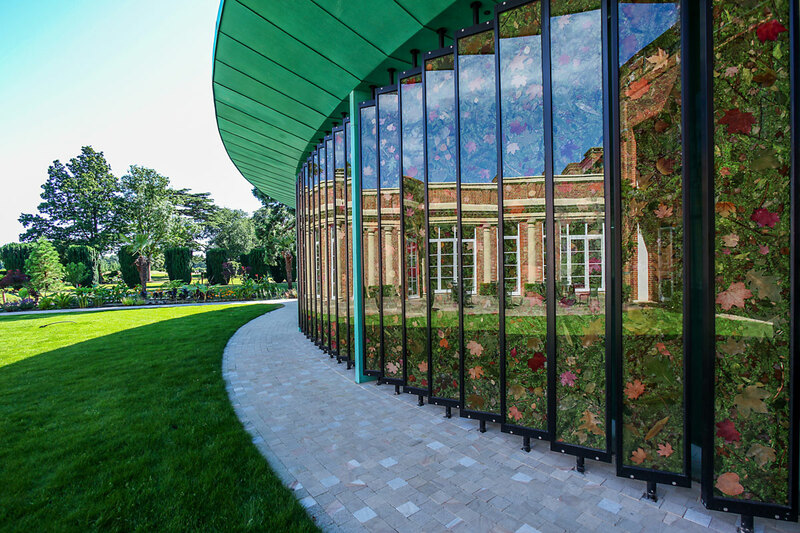 The structural glass blades are 3m-high and are clamped around grass, leaves and flowers captured in a resin core, and can be turned 90 degrees by hand to screen off the view. The copper cladding, which is KME Tecu Patina, supplied by SIG Zinc and Copper, is supported by 18mm plywood formed against the timber and steel ribs which form the cantilever. Initially the plan was to use a double overlap joint, but this would produce a 50mm band at every joint, which would be very noticeable. The completed pavilion has a single overlap joint with two interlocking fingers, so that the joints almost disappear in one direction, and show just a single line in the other direction. As well as being a subtle, elegant solution, the joints tapering into the end of the cantilever come together much more elegantly in a fan-like array. Sample double and single overlap joints were produced in a full mockup of the cladding on site to show the client how the cladding will look. Copper has a high coefficient of expansion, but the cladding has been designed with a large number of single overlap joints, providing relative expansion joints all along the cladding. “The one element that has a lot of movement joints is the copper”, says Wright. Forming the tip of the cantilever was a similar solution, this time with a single piece of timber cut to one of the two curves. “This was a great collaboration with CEL to come up with this solution,” says Wright. The design team faced a particular height constraint with this project, dictated by the balconies in the building behind the ellipsoidal pavilion. This produced some particularly ingenious structural decisions to enable the greatest possible interior height for the Interior Architect, Martin Hulbert, to exploit, in an area where he also used the KME Tecu copper to stunning effect. The supporting columns of the structure are 300×100 hollow rectangular section, which whilst standard, are not used very often and look very slender in one direction, adding to the perception of lightness. These columns support the whole weight of the roof but also act as part of a portal frame, allowing for a single, uninterrupted, interior function space. As a portal frame, the hinges are the most stressed part of the structure, but these are hidden within the depth of the cantilever, further assisting in the perception of lightness. 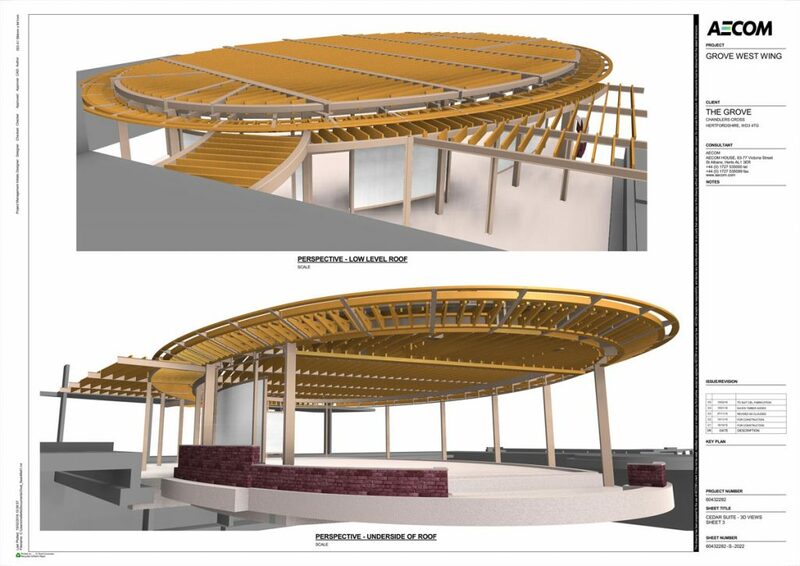 This shallow pre-cambered portal frame roof structure is designed to incorporate a pattern of timber joists within the same depth as the steel portal frames, allowing the structure to take up the least possible depth, whilst working to its most efficient for both steel and timber. In the interior Martin Hulbert decided to make the most of this work by painting the structural plywood soffit black, allowing the full height of the space to be perceived and punctuating the ceiling with leaf-shaped, floating canopy acoustic ceiling units. 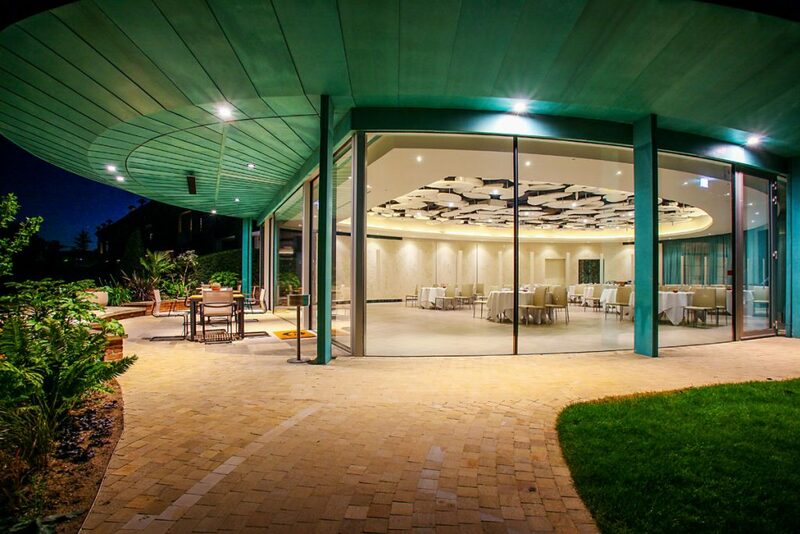 The piece de resistance to the structure is a 6.5m cantilevered overhang at the garden entrance. Here two columns are removed, which involved further careful thinking to ensure the deflections in the structure did not produce a dip in the edge of the eaves, especially to take into account the rainwater downpipes which are hidden behind the next set of columns – also clad in copper. The result is an amazing unbraced structure which almost disappears into the garden. If you’d like to work on a project which produces such a successful outcome, Michael Wright has some advice. Teamwork between architects and engineers works well, says Wright. This was a collaborative approach, which you can see in the finished result. “I was coming up with details to enhance the architecture, and they responded likewise,” he says. This approach allows all professionals to use each other’s skills to support the overall objective. “Whilst we gave priority to elegance, we always looked at cost effective solutions that were easy to build”, Wright adds. Elegance was the key objective, yet buildability and cost effectiveness permeated throughout the design. “If at the end of the project you can say you have designed it in sufficient detail to have no surprises, you’ve done your job well.” There were hardly any queries from site. Wright is a keen advocate of collaborative working. The architect, interior architect, engineer, contractor and product supplier all have their own specialist areas of expertise and awareness – each part of this team needs to work together to get the best solution. Look out for your October copy of the RIBA Journal to see an interview with the architect, Jeremy Blake of Purcell. We’ll also be publishing a blog post with other resources, sign up to receive your copy by email. Find out more about the copper used in The Cedar at The Grove. 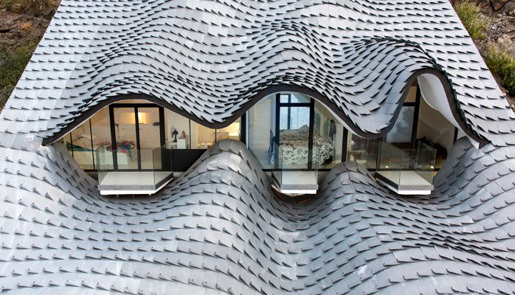 Find out more about our holistic approach to roof design. Photography Copyright Galliford Try, Terrence Smith Photography and Structural design by AECOM. Used with Permission, all rights reserved.